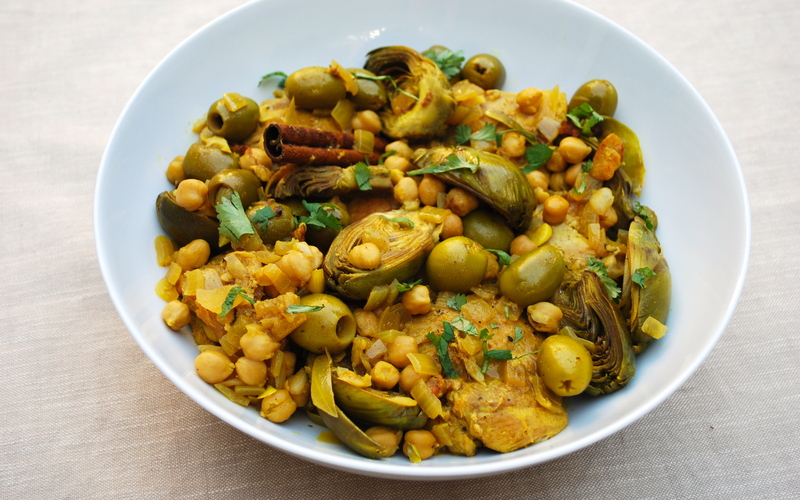 Braised Chicken with Artichokes and Olives | Time to Cook! I’ve made this recipe a few times and it’s always a hit (even with the kids)! If you love artichokes (um, yeah!) and olives (yeah! ), and you’re looking for something new to do with chicken (please! ), then try this meal. I serve it with crusty bread (rustic sourdough loaf) which is great for soaking up any excess liquid. I hope you love this! Pat the chicken dry and season salt and pepper. Heat the olive oil in a Dutch oven or heavy soup pot over medium-high heat. Add the chicken, working in batches if necessary, and cook until well browned on each side, about 3-4 minutes per side. Transfer to a plate. Decrease the heat to medium. Add the onion and a pinch of salt and sauté until soft and slightly golden, about 5 minutes. Add the garlic and sauté for 1 minute. Add the turmeric, cumin, coriander, red pepper flakes, cinnamon stick, and bay leaf and cook, stirring constantly, until fragrant, about 1 minute. Pour in 1/4 cup of the broth to deglaze the pot, stirring to loosen any bits stuck to the pot. Stir in a pinch of salt and cook until the liquid is reduced by half. Stir in the remaining 1 3/4 cups of broth, the lemon zest, and 2 tablespoons of the lemon juice. Decrease the heat to medium-low, add back the chicken thighs, and cover and simmer for 15 minutes. Add the chickpeas, artichoke hearts, and olives and stir gently to combine. Increase the heat to medium-high and simmer uncovered, stirring occasionally, until the chicken is heated through, about 5 minutes. Check largest chicken thigh with a digital thermometer to make sure it is cooked through to at least 170 degrees in the center. Stir in the remaining tablespoon of lemon juice. Taste; you will likely want to add another squeeze of lemon juice and a pinch of salt. Garnish with the mint or cilantro.